Roughly 445 companies in non-oil sector carried out export operations in the amount of $149 million in May, reads a report by the Center for Analysis of Economic Reforms and Communications. 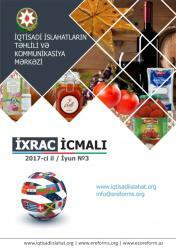 The report on products exported by Azerbaijan in June, shows that the companies basically exported tomatoes, potatoes, polyethylene, methanol, other mixtures, rectangular plates, gold, hazelnut, cotton, onions, apples, etc. During the first 5 months of 2017, the total volume of non-oil export operations with the participation of 1,021 companies amounted to $557 million. 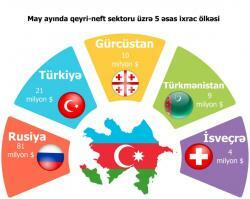 The top five countries importing non-oil products of Azerbaijan include Russia, Turkey, Georgia, Switzerland and Turkmenistan. For May, through the AzExport portal, non-oil products worth $19 million were ordered. The geography of export orders through the AzExport portal expanded, as for the first time orders were received from Slovakia, Taiwan and Suriname. Among the orders received during the month are powdered milk, sunflower oil, chicken meat, carrot, wine, butter, apple, pomegranate, pomegranate juice, tea, cosmetics, fuel, paint, silk carpet, bed linen, etc. 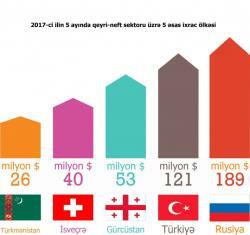 In January-May, through the AzExport portal, Azerbaijani products were ordered for an amount exceeding $130 million from 45 countries. 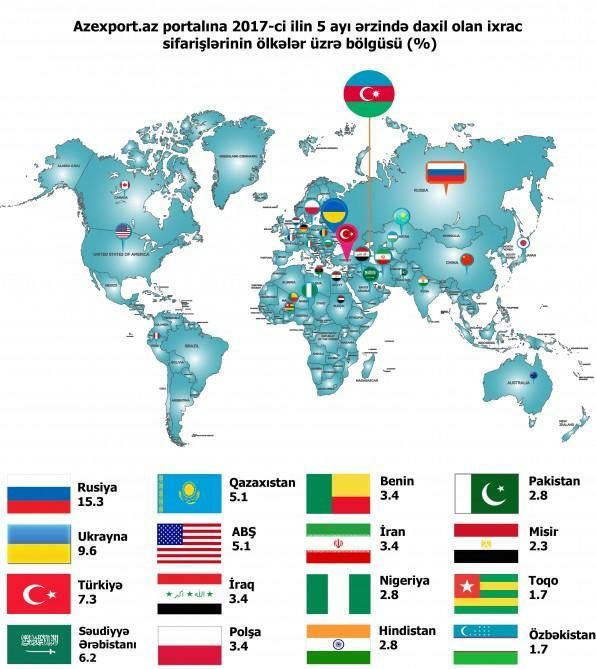 Russia leads the list of countries that have made orders from Azerbaijan, according to the report. Some 15 percent of export orders fall to Russia's share. Among the orders were nuts, cognac, carrots, yellow onions, wine, apples, tea, cottonseed oil, cosmetics, cherry concentrate, medical gauze, mushrooms and others. About 10 percent of orders fall to Ukraine’s share. 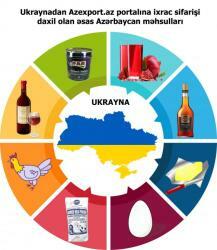 Ukrainians basically order from Azerbaijan pomegranate juice, cognac, facade paints, wine, tobacco, chicken meat, butter, medical gauze, bed linen, milk powder, etc. 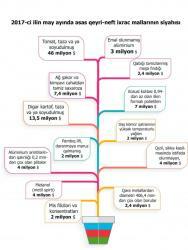 As for Turkey, it accounted for 7 percent of the total volume of orders. During this period, Turkey mainly imported tobacco, motor oil, wine, pomegranate wine, chicken meat, cottonseed oil, peas, buckwheat, sunflower oil, milk powder and so on. The volume of export orders received in January amounted to $48 million, in February - $6.5 million, in March - $27 million, in April - $29.9 million and in May- $19 million. 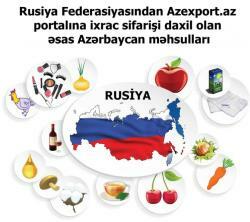 Azexport.az was created according to the order "On creation of a unified database of goods produced in Azerbaijan Republic", signed on 21 September 2016 by President Ilham Aliyev.